Everyday achievements become charming illustrated stickers. The life of a freelancer is filled with more work and admin than a lot of employed people realise. There's the taxes to take care of, long hours toiling away alone, invoices to chase up, and that's without taking the actual work into consideration. To give freelancers a feeling of validation, Brooklyn-based illustrator Jeremy Nguyen has created a bright and fun set of achievement stickers. Covering work tasks such as reading contracts and Skype sessions, this funny set also reminds freelancers to take care of themselves with stickers for going outside and sleeping. Nguyen's work has been featured in The New Yorker numerous times, and his new sticker set is the latest to be featured on the hallowed site. 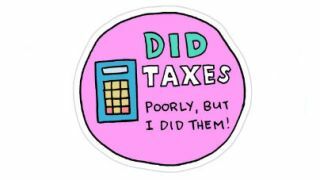 There's no sign of whether you can actually buy these stickers and start slapping them onto your phone, laptop or forehead, but seeing as they've proved so popular among freelancers, surely it's only a matter of time until their available to order. Explore the full collection of stickers by clicking left to right in the gallery below. Is any draft ever truly the final draft?